FAIRFIELD, CONNECTICUT, January 5, 2015 – – Voice-over talent Peter K. O’Connell was retained by General Electric to serve as narrator for a recently produced corporate video presentation. Working Capital Solutions (WCS), a business unit of GE, asked O’Connell to narrate a company presentation outlining how WCS helps GE generate and maintain healthy levels of working capital including accounts payable, inventory and accounts receivable. In 2013, GE delivered solid results despite the volatile economic climate with earnings of $16.9 billion. Industrial cash flow from operating activities for the year remained strong at over $17.4 billion. GE traces its beginnings to Thomas A. Edison, who established Edison Electric Light Company in 1878. In 1892, a merger of Edison General Electric Company and the Thomson-Houston Electric Company created General Electric Company. GE is the only company listed in the Dow Jones Industrial Index today that was also included in the original index in 1896. America’s Friendly, Neighborhood Voice-Over Talent, Peter K. O’Connell, has worked with a wide variety of companies from around the world in addition to this most recent project for General Electric. Some of Peter’s clients include Kraft Foods, PBS Television Network, Shell Oil, Pitney Bowes, Bacardi Rum, Highlights HIGH FIVE Magazine, Deloitte Canada, Rich Products, U.S. Army, Starz Cable Television Network, BlueCross BlueShield, SunSetter Awnings, Time Warner Cable, Harlequin Enterprises and Darien Lake Theme Park. so about the delay in sending my Christmas card this year…. So during Christmas week, all I had to do was sort through my databases, clean up the usually junk and then hit send to get my Christmas card eblast out. 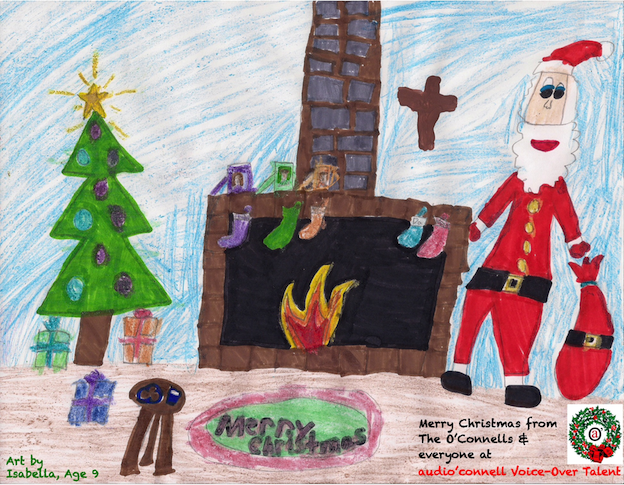 The card itself was done (complete with the annual great work by my in-house artist). The list should have been pretty easy because I include almost everyone in the Christmas card e-blast including other voice-over talent. Normally when I do an e-blast, I omit all voice-over talent because they are not my target market audience. That was the plan, anyway. Except last Tuesday (12/23) I got walloped with the stomach flu that lasted through the week (even #3 got into the spirit by getting sick on Christmas morning). So the card didn’t get send out until this week. Most of my friends and clients really won’t care and the folks who might judge me…well I don’t care if they do – they’ll miss the spirit of the whole thing. But here is the part I found funny. So I have almost 4,000 email addresses. I know that maybe 20 folks who get the e-blast holiday message will unsubscribe from my list. I always find it strangely awkward that someone chooses THAT particular e-blast, of all the ones I send all year, to unsubscribe, but oh well. I don’t begrudge that they wish to unsubscribe and I will certainly honor their wishes…but really? Unsubscribing from a Christmas card? I mentioned this goofiness on Facebook and in addition to the funny comments it garnered, there were more than a few folks concerned they hadn’t yet got the email blast card! How funny they didn’t want to be left out and nice that it was important to them — it’s gotta be the artwork! I explained that because there were almost 4,000 emails, I break them up into hourly ships of about 500 addresses each…it just makes things go smoother and the internet Gods don’t get made at me. So between 8:00 a.m. and 3:00 p.m. ET, people got their emails. The updates were post on social media as the day progressed: “I finally got it!” and “I got mine!” And of course many sent kind regards back via email. In case for some reason, you didn’t get yours, worry not – now you have. 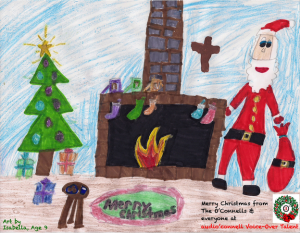 Merry Christmas and Happy New Year from the O’Connells!